For the past decade, the ReStore has been an increasingly popular source of recycled building materials, saving money for professional contractors and do-it-yourselfers alike, all while easing the burden on landfills. The store, now renamed EcoBuilding Bargains, has outgrown that space and will soon move into a much larger building nearby. And the way that structure is being renovated provides an effective case study in the value of green construction and energy efficiency. John Majercak wants to lead by example. 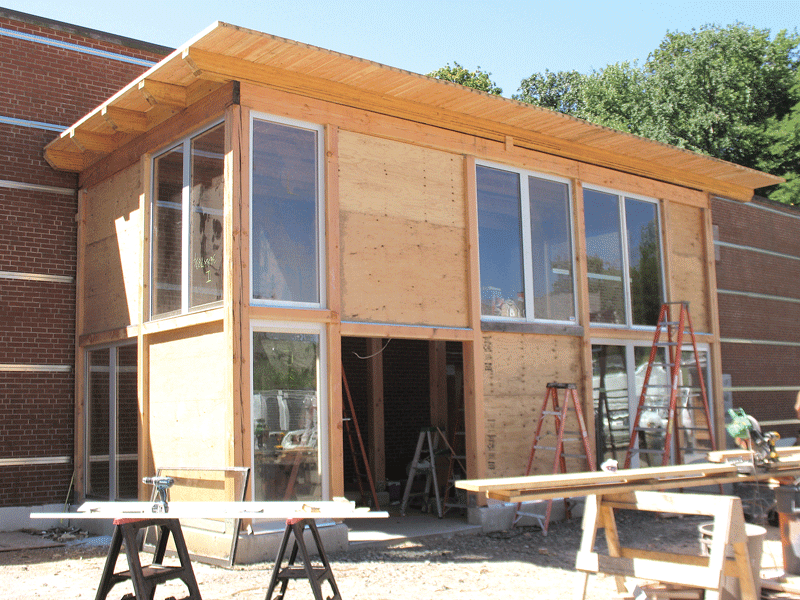 And when EcoBuilding Bargains — formerly the ReStore — opens its vastly expanded retail center in Springfield later this fall, he’ll have the ideal showcase to demonstrate how homeowners and contractors can make profitable use of recycled materials and save money through energy efficiency. Because that’s how the new store is being built. The building in question — a century-old structure on Warwick Street that was originally home to the National Biscuit Co., then Steiger’s, and most recently a warehouse for Kavanagh Furniture — is being expanded and renovated from top to bottom, eventually tripling the retail space of the ReStore’s original Albany Street site and quadrupling its total area. That feat will be accomplished with an array of improvements — encompassing roofing and siding materials, insulation, and the systems that heat, cool, and illuminate the space — that promote cost savings through energy efficiency. Those strategies, combined with the copious use of recycled materials throughout the building, effectively turn it into an educational model of the store’s very mission. John Majercak says the store will be lined with cutting-edge insulated panels that seal in air, one of many facets of the building’s energy retrofit. In the decade since it opened, the ReStore — which, at its core, trades in recycled building materials, with the twin goals of saving contractors and do-it-yourselfers money and reducing the burden on landfills — has become increasingly popular, to the point where it has outgrown its space on Albany Street. 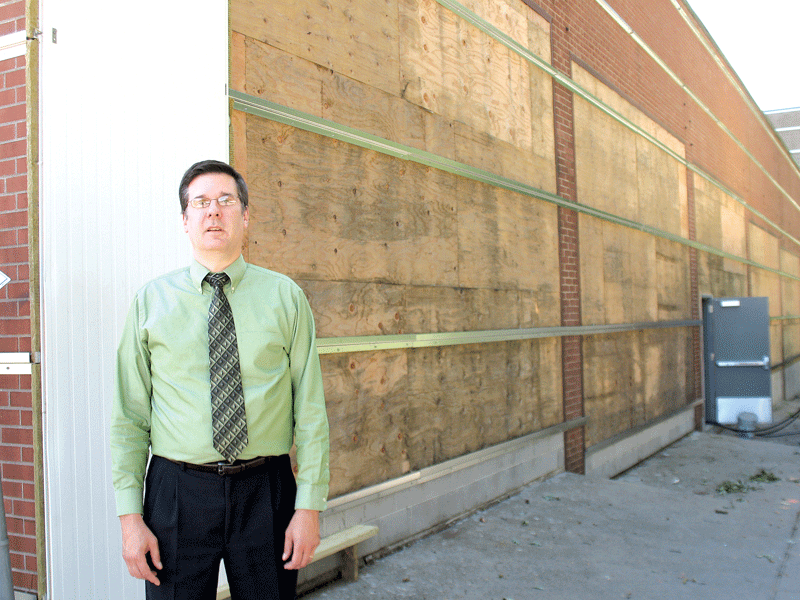 “The store sells low-cost building materials so people can fix up their homes,” Majercak said. “We get all kinds of stuff from other people’s homes and remodeling jobs; they donate it or hire us as a contractor to do the deconstruction ourselves. The efficiency improvements — part of a $900,000 energy retrofit, a significant portion of the total $3.1 million project cost — begin on the exterior of the building, including a white roof to deflect heat and insulated panels lining the building that interlock in a way that seals out all air leakage. EcoBuilding Bargains will also “superinsulate” its roof, Majercak explained, using insulation donated from MassMutual when that company installed a solar array on its roof. In addition, the 3 million-BTU, oil-fired boiler in the basement is being replaced with a 500,000-BTU gas unit, while infrared tube heaters located throughout the structure will heat building occupants but not the air. That model of efficiency extends to lighting as well; much of the store will feature sensor-controlled lights that maintain a low level when no one is around them, but become brighter when someone walks in. “That saves energy, too,” Majercak said. The goal, besides reducing costs while greatly expanding floor space, is to demonstrate the types of changes people who visit the store can make in their own homes. The simple fact that the ReStore needed a new home testifies to the growing popularity of its ‘reduce, reuse, recycle’ model. “People who shop here do so because of the great deals, or they believe in the mission of keeping stuff out of landfills, or both,” Majercak said. “When we opened this up 10 years ago, there were maybe a dozen or two stores like it in the country. There are about 800 now, and we have our own association; I’m on the board of it. Majercak expects the business to continue to grow, both through public awareness of the store and in its deconstruction efforts, which have “really taken off” in recent years. “We’ve worked with Kent Pecoy, R.J. Chapdelaine, Dan Roulier, and some the other big builders around the area. They’ve used us for deconstruction, and we’re working throughout Southern New England and New York now, doing jobs,” he told BusinessWest. 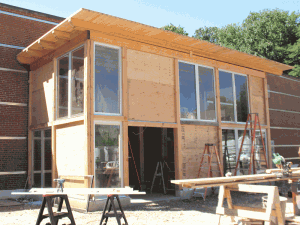 EcoBuilding Bargains is reaping more than just new business, however. About one-third of the $3.1 million building rehabilitation is being funded by a capital campaign, while another third has come in the form of a low-cost mortgage from Westfield Bank; government funding covers a little less than one-third as well. In addition to the capital-campaign support, “a number of businesses have contributed monetary resources or products or in-kind services — lawyers, architects, all kinds of vendors,” he noted. “All the gas pipe was donated from local pipe suppliers. People have been very kind and very supportive.